The Structural MK IV (Diamond) is an item added by the JABBA mod. 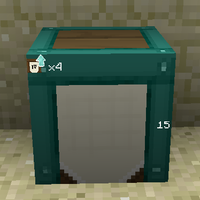 An upgrade used on a Better Barrel to increase the upgrade slot capacity to 15, these slots are used to receive upgrades such as the Storage upgrade. Requires Structural MK III (Gold Ingot) to be installed first. 'Shift+Right-click' to install. The Barrel frame will turn blue green, the colour of the material used to make the upgrade. The Barrel also shows the level of upgrade installed and the number of slots available on the right side edge. Structural MK IV (Diamond) has no known uses in crafting. This page was last modified on 23 December 2015, at 23:59.